No Man's Land is a forgotten film from 1987 that stars D.B. Sweeney, Charlie Sheen, and one of the best (and most blatant) product placements for Pepsi that you'll find in a movie. Yes, it's that kind of film, serious and fun at the same time - a mix of hard-edged crime-drama and good ol' practical action pieces and stunts. It's also the kind of movie that really doesn't get made anymore, which makes re-discovering (or, for many of you I'm guessing, discovering for the first time) this film on Blu-ray such a blast. 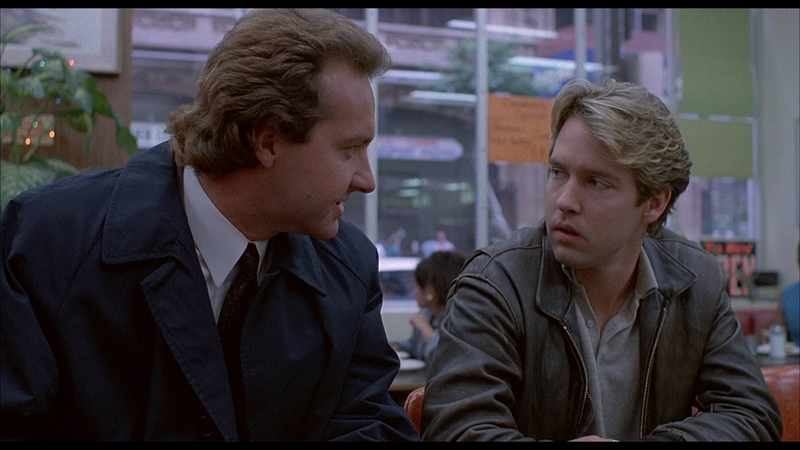 Sweeney stars as Benjy Taylor, a Los Angeles rookie cop who is recruited by his boss (Randy Quaid) to go undercover to get evidence on a local "chop shop" that's involved in stealing Porsches, including someone who killed an cop already investigating the case. Taylor is picked for two reasons: he's a handy mechanic and, being a rookie, he's less likely to be suspected of being a police officer. 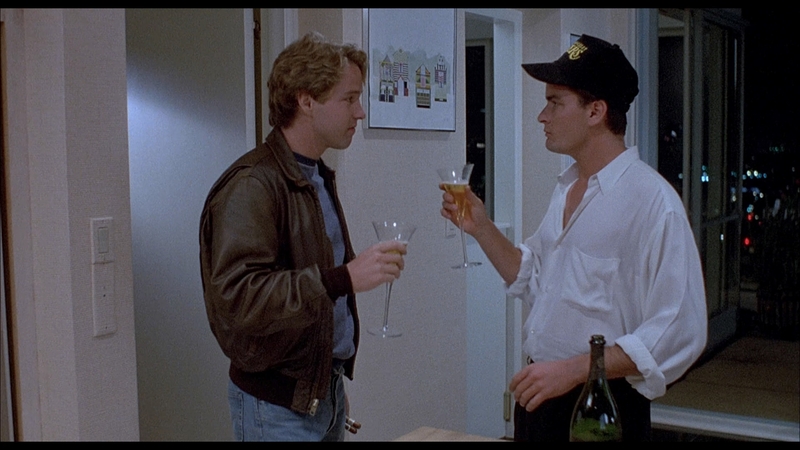 After working at the Porsche shop for a few days, Benjy is sent out to help fix the broken-down vehicle of Ted Varrick (Sheen), and the two strike up a friendship with each other. It soon becomes obvious to Benjy that Ted is the kingpin behind the local car lefts, and may be responsible for the cop's murder as well (and possibly others). But as Benjy goes deeper and deeper into Ted's world of fast cars and glamorous parties (including feeling the rush of being asked to steal cars himself), he starts to become seduced by the criminal lifestyle. Things become even more complicated when Benjy starts to fall hard for Ted's sister, Ann (Lara Harris). Like many movies of its day, No Man's Land is elevated from typical movie fare by a strong supporting cast. Not only do we get Randy Quaid as a police lieutenant, but there's also Bill Duke as the owner of the Porsche shop, R.D. 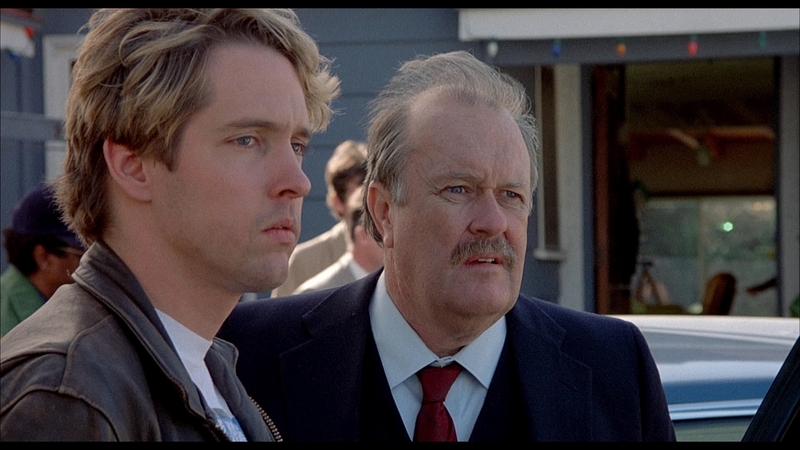 Call as the leader of a rival car theft operation, an uncredited George Dzundza as Benjy's father, and the great M. Emmet Walsh (of whom Roger Ebert once said, "No movie with M. Emmet Walsh in a supporting role can be altogether bad") in a cameo as a police captain. These actors come and go from the film, but make it immensely watchable. No Man's Land is no cinematic masterpiece, but it is surprising it didn't get at least a moderate reception at the box office in 1987. It's also a bit shocking that it hasn't even really become much of a cult favorite over the years. But now might be the chance to change that. If you're a fan of 80's action fare, give this one a look - it's worth your time. No Man's Land races onto Blu-ray from Kino Lorber in a standard Elite keepcase. The 50GB dual-layer disc is packed alongside a 22-page booklet featuring box cover images of other titles (four per page) from Kino's "Studio Classics" label. The Blu-ray doesn't have any front-loaded trailers, and the main menu consists of a still of the box cover image, with menu selections across the bottom of the screen. No Man's Land was shot on 35mm film and is presented here in its original theatrical aspect ratio of 1.85:1. Transfers are often hit or miss on Kino Lorber titles, since a huge percentage of the time (read: almost always) Kino has to use the transfer provided by said studio, and has no say in its quality. The good news is that this is a pretty solid transfer. There's still a lot of dirt and debris on the print (particularly during the opening credits), but color reproduction is great, details are impressive throughout, and there's still a healthy amount of grain on the print, an indication that any DNR use on the image was mild, at best. Black levels are far from inky-deep, but they're good enough that shadow delineation and noise aren't issues in the dark and/or nighttime sequences of the film. This is by no means a fantastic transfer, but as Kino Lorber releases go, this is one of the better ones I've seen and viewers should have no major complaints. The only audio track (other than the commentary track) on this release is an English 2.0 DTS-HD Master Audio track, and it's surprisingly decent given the stereo limitations. There's a good amount of separation and distinctness between the two speakers, with a lot of back and forth playfulness with both the movie's synthesized soundtrack (by composer Basil Poledouris) and with some gunplay that takes place in the movie. Dialogue is clear (if not always crisp), and viewers/listeners should have no issues discerning the spoken word. All in all, a solid aural presentation. Audio Commentary - The Producer-Director of King Cohen, Steve Mitchell, and frequent Kino Lorber audio commentator (and film historian from Mondo Digital) Nathanial Thompson team up again (they've done other commentaries for Kino) for a fun, informative look at this movie. While the commentary isn't always screen-specific, I love the fact that Mitchell is obviously a huge fan of 80s movies and not afraid to geek out about them. As always, Thompson is an encyclopedia of knowledge, providing lots of background info about the actors and the production. Another great commentary from the folks at Kino, and well worth a listen. Interview with Star D.B. Sweeney (HD, 16:15) - This brand-new interview with Sweeney is by far the best extra on this release. Sweeney doesn't pull any punches talking about the movie, nor does he refrain from providing personal info: telling us exactly what he got paid for the movie (after accepting the studio's request to take second billing after Charlie Sheen). On top of that, Sweeney has some great Charlie Sheen stories to tell us, and a pretty fantastic Sheen impersonation on top of that. I often wonder why D.B. Sweeney never became a bigger star. After seeing his charm in this interview, I'm still wondering. Interview with Director Peter Werner (HD, 15:58) - I'm embarrassed to admit I was completely unfamiliar with Werner before seeing his interview here, only to go online and discover he's had a huge career as a television director and even won an Oscar back in 1977 for Best Live Action Short Film. It was pretty obvious in the D.B. Sweeney interview that the actor was less than thrilled with this director (although he didn't say anything really that negative about him), and Werner seems to agree here that some of the actors (including Sweeney) had issues with him on the set. Regardless, Werner comes off as an introspective guy who isn't afraid to admit the problems with the movie, although he still is quite proud of how it turned out. This is another worthwhile extra that viewers will enjoy. Trailers - A collection of five trailers, including the one for this title, all available from Kino Lorber and all of which must be watched individually (there is no "Play All" option). They consist of: No Man's Land (SD 1:43), The Last of the Finest (HD 2:08), Freeway (HD 1:36), This Park is Mine (SD 2:08), and Assassination (HD 1:57). A box office dud back in 1987, No Man's Land is actually a very good crime drama/action movie that somehow never got the attention it deserved. It's an entertaining flick, with a strong cast and some good ol' 80's action that fans of that period of filmmaking should enjoy. Recommended.